Beast Coast member-made roar of a Rye blend. Back in August, Flaviar decided to find out once and for all: which Coast is the shizz?! East Coast and West Coast have been fighting each other in basketball and hip-hop (with various degree of violence), but which side of the States has the best palate? Time to exploit the good old rivalry and discover the truth! When August began, WhistlePig went to the City of Angels and tested the Western Conference, and when the month came to an end, they did the same in the Empire State. This is how it went down: each of the two blending showdown events had five groups of five Flaviar members, their own blending station and through some Flaviar/WhistlePig guidance, they had to find the perfect blend of WP's Madeira, Sauternes, and Port finished Rye blend. Then, the members and both the Flaviar and the WhistlePig team voted on it and they found the winners. And guess what? You get to try both of them. The eternal rivalry was a ruse to bring the best out of our master blenders and create something unique and grand. 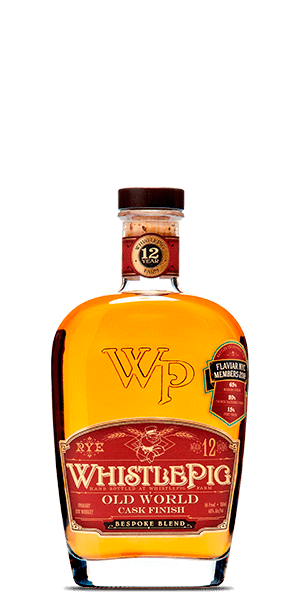 As we said, it's a blend of wonderful WP 12YO Rye Whiskeys, matured in American oak barrels, finished either in ex-Madeira, ex-Port or ex-Sauternes casks. The Spirit made in New York is 65% Madeira, 20% Sauternes and 15% Port. There were only three barrels, which means four bottles short of 400. And since we're so excited about this: it was blended exclusively by Flaviar members in New York! What does WhistlePig Rye Flaviar Blend 2018 New York Edition taste like? The Flavor Spiral™ shows the most common flavors that you'll taste in WhistlePig Rye Flaviar Blend 2018 New York Edition and gives you a chance to have a taste of it before actually tasting it. Lavish caramel on the nose followed by vanilla and winter fruit scents. Rye spice and apricots with hints of plums, raisins, dates, and a lovely touch of honey. Dark chocolate, caramel, vanilla, and winter fruit. Loved it, very smooth with a little bite at the end. Couldn't stop enjoying it. After waiting to receive it It proved to be worth the wait. Wish I had ordered 2. Great flavor, great finish, I was surprised by how much I enjoyed this edition. The burn in this kept the flavors going, I will be going for both bottles next year this is an unexpected surprise. Exceptional and smooth. A slight satisfying burn doesn't diminish the flavors. Preferred the NY edition to the LA.....but neither as good as the 2017 Flaviar edition! Tip a glass! I didn’t enjoy it as much as I had hoped. It was a sweeter than I thought it would be.